As music students journey to class towards their Mecca, Bercher Hall, they are guided by the sounds of triumphant euphoniums, trilling strings, angelic flutes and trumpets soaring towards their highest ranges. What Bercher Hall lacks in proper lighting and easy-access, it makes up for with the sounds of students practicing their craft and finding musical partners in the process. To combat the challenges of socializing in Hunter’s commuter-school environment, music students are getting together and jamming whenever they can. They will typically practice music assigned in class, music they are working on personally, improvised music, or a combination of all three. 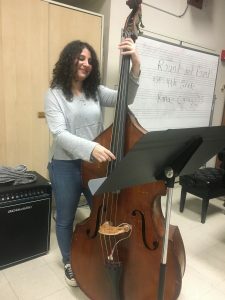 Though jam sessions can be structured, Yeva Mishailov, bassist, and her peers note that they tend to be more fun when they are not. Hunter students jamming in preparation for an in-class recital. Photo by Michael Waxman. “It really does bring people together and I’m definitely making a lot more friends that way,” Mishailov said. Bassist Yeva Mishailov performing a solo during a jam session. Photo by Michael Waxman. On a recent Tuesday, Mishailov and a few classmates were assembled in 635 Bercher, preparing for Derrion Malik’s in-class recital scheduled for the next day. With Sebastian Belliard on drums, Oliver Glynn on piano and Mishailov on the upright bass, the three were doing Malik a favor by performing with him. “Music really brought us together,” said Malik, who has never even been in a class with Belliard. “Yeah, we all know each other better now,” agreed Belliard. The room’s dirty floor tiles, chipped gray walls and dulled lavender curtains began to feel brighter as the quartet gained confidence in their sound and performance. Their reluctance to solo and hyper-apologetic demeanors upon making mistakes indicated that nerves commanded their attention at the beginning of the jam session. However, they encouraged each other until they were able to play through the piece without mistakes by the end of the one-hour rehearsal. Even other students who sat quietly and unmoved in the back of the room could not help but poke their heads up when one of the quartet members did something impressive during one of their solos. From this particular jam session, you can hear a solo from pianist Oliver Glynn below. Though jam sessions are light-hearted in spirit, they are not all fun and games. The quartet points out that musicians do feel pressure during jam sessions, despite their informal and relaxed nature. Regardless of the pressure, the quartet insists that jams are supposed to be more fun than anything else and are open to all Hunter musicians; not just music students. Although these four musicians tend to jam on Fridays and Sundays, you can get the jam session experience by visiting Bercher Hall or the percussion room on the 4th floor of Hunter North after almost any organized music class or rehearsal. Author: Michael Waxman Michael Waxman is a senior at Hunter College, seeking a B.A. in political science and media studies. He just turned 21 years old this past July and is native to a small subsection of Coney Island called Sea Gate. While reporting for The Athenian, Michael is also interning at CUNY TV as well as hosting a radio program called “In My Bag” at WHCS Radio, Hunter College’s independent radio station. He is passionate about social commentary and is seeking a career where he can contribute to discourse as well as create content that can help guide others through societal and emotional confusion. In his spare time, Michael consumes hip-hop music and culture, goes to art-related events with his friends, and goes on the hunt for the best Trinidadian doubles and dairy-free chocolate desserts.